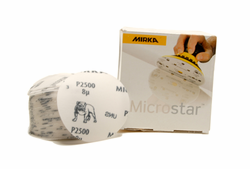 Mirka Microstar Sanding Discs are intended specifically for dry sanding applications. A stearate coating on each disc helps prevent abraded material from sticking to the face of the disc, making it resistant to clogs so that each disc will outlast the competition. The full resin bonded aluminum oxide grain ensures that Microstar Sanding discs create a fine scratch pattern that is easily buffed away to reveal perfect results. While many restoration projects require in-depth wet sanding, there are others that can be corrected using the less-aggressive dry sanding approach. Wet sanding is considered far more messy by many due to the slurry of abraded material that remains on the surface until wiped away. While wet sanding seems to be an auto refinishing industry standard, dry sanding certainly has its place, and there�s no better dry sand paper than Mirka Microstar Sanding Discs! Mirka Microstar Sanding Discs offer smooth and consistent results. These cutting-edge sanding discs produce very little dust, revolutionizing the way that people think about sanding. What�s more, each disc is designed to outlast traditional sanding papers thanks to the no-clog stearate coating, reducing the environmental strain that an extensive restore can create. For better control, Mirka Microstar Sanding Discs should be used with a 5mm interface pad. This will also help the discs flex to meet the contours of the surface being sanded, offering greater overall versatility. Mirka Microstar Sanding Discs help level the area around deep scratches, creating a uniformly smooth surface that can be polished to perfection, often times eliminating the scratch completely. Use Mirka Microstar Sanding Discs on headlights, gel coat, clear coat finishes, lacquer finishes, and any other surface that requires smooth, consistent sanding results. Available in 3 inch and 6 inch diameters.